All participants are kindly invited to participate in the Opening Ceremony, which will offer Korea's unique hospitality, and present a crucial opportunity to experience the culture and traditions of Korea and Jeju Island. The organizing committee is looking to plan a banquet dinner to welcome all WCHR 2014 participants. 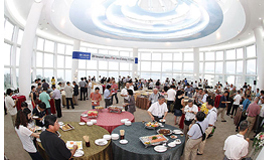 The Welcome Dinner will run from 19:00 to 21:00 at Ocean View & Foyer located within ICC Jeju. The Welcome Dinner will be an excellent opportunity to catch up with old colleagues and make new friends while enjoying some delicious foods and refreshing beverages. Come and join this entertaining ice-breaker to expand professional networks and form partnerships! What will make WCHR 2014 more pleasant may be a picnic lunch dubbed the Picnic Lunch with Pacific Spirit, which is scheduled for May 15. Congress participants will have a great opportunity to enjoy not only lunch but also the splendid scenery of Jeju in the midst of a beautiful outdoor setting overlooking the Pacific Ocean. That's why it's called the "Picnic Lunch with Pacific Spirit", which will certainly give you the feel of taking a picnic on a spring day. After lunch, you could also take a walk for a look at JusangJeolli Cliffs, where volcanic rock formations rise out of the sea like pillars. These splendid cliffs are within a few minutes walking distance from ICC JEJU. Near Jungmun Beach, a popular spot for vacationers and locals is an impressive pillar rock formation named JusangJeolli Cliffs. The formation looks like a piece of art that has been sculpted delicately with a sharp tool. JusangJeolli Cliffs usually refer to vertical pillars shaped rocks in a rectangular or hexagonal shape and are often composed of basaltic lava. Such a formation is the result of a sudden contraction when thick molten lava flows from an active volcanic crater and cools rapidly. This site is full a wonder of nature, where hexagonal rock pillars stand on top of each other like giant stairs. The waves that hit the pillars are also interesting to see when the tide is high, as they can leap up to 20 meters high. These magnificent cliffs, 30~40m high and 1km wide, are the largest such formations in Korea and are designated as Natural Monument No. 443. Thanks to a viewing platform with wooden steps, it is possible to see JusangJeolli Cliffs closely. This tour program is one of the highlights of WCHR 2014 the organizing committee has to offer. The program will give all participants a taste of the breathtaking beauty of Jeju Island, and of many natural wonders Korea has to offer. Join one of the following three courses and see firsthand how wonderfully Jeju natures have been preserved. for this complimentary tour when you register for the Congress. hotels in which they are staying. * Please note that tour reservations will be on a first-come, first-served basis. * Please refer to the bus and tour schedules below. Harboring the crystal-clear skies and winds, Camellia Hill is a camellia arboretum that was created on a plot of land behind Mt. Hallasan, which spans 172,000 square meters. Camellia is called the queen of winter flowers as it overcomes the harsh winter, blossoms in the snow and cold; so, its unique beauty is loved so much by the world. The arboretum is home to 6,000 camellia trees of 500 different species including species that are known to produce the world's largest and earliest blossoms. In addition to camellia trees, the arboretum also boasts palm trees, wildflowers, and other plants as well as a sprawling grass plaza and an ecological pond. Auxiliary facilities include a gallery exhibiting camellia-themed handicrafts and a multipurpose seminar room. Camellia Hill also offers a variety of lodging facilities ranging from thatched cottages and wooden cottages to steel houses and a condominium-type resort. And, Camellia Hill provides many interesting things to see, as well as a variety of foods, beverages and entertainment to enjoy, enabling you to understand what it means to take a rest in nature. For more information, please visit www.camelliahill.co.kr (written in Korean only). The Spirited Garden is one of the major tourist attraction sites on Jeju Island and has been recognized as the "most beautiful garden in the world" by the press and internationally renowned guests who have visited since its opening in 1992. This garden, where maple trees, wisterias, pine trees and other rare species of trees as well as wildflowers and orchids collectively form a unique scenic harmony, offers an unsurpassed opportunity to relax your soul and commune with nature. Jeju's natural characteristics, spiritual peace and tranquility that contributed to the creation of the garden will lead you to the inspirational environment you have never experienced before. The refined garden art that greets you with profusion of taste and color depending on the season of the year or time of the day invites you into a world of profound inspiration to uplift your spirit. For more information, please go to www.spiritedgarden.com. Located within the Jungmun Tourist Complex, Yeomiji Botanical Garden has the world's largest glass greenhouse and a wide selection of rare plants, creating a tropical ambience. The indoor garden contains approximately 2,000 rare tropical and subtropical plants including Flower Garden, Water Lily Garden, Jungle Garden, Subtropical Fruits Garden, Cactus and Succulent Garden, and Observation Platform. The 38 meter observation platform at the center of the greenhouse allows visitors to get a clear view of the surrounding landscapes including Cheonjeyeon Falls, Mt. Hallasan, and Korea's southernmost island of Marado. The exotic outdoor garden houses Jeju Native Garden, as well as Korean, Japanese, Italian and French folk gardens. For more information, please visit the website: www.yeomiji.or.kr. The night before the closing of the Congress will be another spectacular banquet dinner time as a wide selection of foods, drinks and entertainment will be on offer to make another room for networking among WCHR2014 participants. The Gala Dinner will take place at Cliff Garden in Hyatt Regency Jeju, which is about a 10-minute drive away from ICC Jeju. The outdoor venue in Hyatt Regency is spacious enough for all types of special occasions and events while providing a breathtaking view overlooking the Pacific Ocean to make the Gala Dinner more enjoyable and unforgettable. * make a reservation for the Gala Dinner when you register for the Congress. Committee for participants to easily join in it. The Closing Ceremony/Awards and Farewell Show will take place on May 17, 2014 at Tamna Hall A on the 5th floor of ICC JEJU. No party is ever complete without prizes and entertainment. This fabulous show will feature not only enthralling performances but also an awards ceremony where travel grants, as well as awards for the best oral and poster presentations will be presented. Furthermore, the organizing committee for WCHR 2015 will give you a little sense of how they are going to organize the next Congress to boost your anticipation for it. So, don't miss out on this meaningful closing ceremony, where we will also promise each other we will meet again at WCHR 2015.